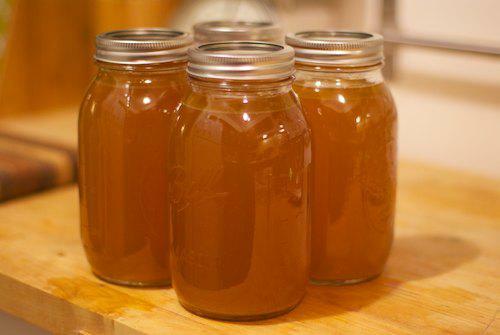 IN A WORD, BONE BROTH IS SIMPLY MAGIC. It's a multivitamin, a medicine for all kinds of ailments, and a delicious food all wrapped up in one. It keeps you healthy, helps you recover when sick, one of the most nourishing foods on the planet and ridiculously easy to make. As an Asian medicine practitioner, I've been prescribing bone broth for years as a cornerstone in the pantheon of "food as medicine". However, it can be somewhat intimidating - especially if your stove happens to be where you store your pots rather than where you use them. It's worth cranking up the slow cooker and brothing like you're on a mission since it's a concentrated form of nature's love in a hot pot. Below is a recipe you can use at home and one that we have each been passing on to patients for years. Super easy. Super simple. Enjoy! 5-8 pounds of grass-fed organic beef soup bones. Union Square farmer's market Misty Brook Farms or Elk Ridge Farms are both great sources. Most butchers will have bones on hand - but if doing this to help repair your gut, it's important that the bones are grass fed and natural as possible so you're not cooking unknown toxins into the broth. Vegetable scraps and/or fresh veggies. You can keep carrot peelings, onion tops, and celery ends in a bag in the freezer to use when ready to make your broth. Veggies such as cabbage, broccoli, turnips, brussels sprouts and beets will give a bitter taste to the broth. Good old fashioned filtered water. Better the water, better the broth! 2 Tbsp Bragg's Apple Cider Vinegar or Balsamic Vinegar. Balsamic gives the broth a well rounded flavor slightly sweet flavor; ACV will give it a more umami savory flavor. Vinegar is CRITICAL since, as an acid, it's what helps pull all the mineral out of the bones and makes them available for digestion. Rinse and clean the bones under clean water. Pat them dry. Roast the bones at 400 ° F for an hour until the bones are browned and yummy smelling. You can put them on a rack in the pan so the fat drains off if you like. Roasting and draining guarantees the beef stock will be flavorful; otherwise you may get an off-taste to the stock. Add the bones to a big pot along with any vegetable scraps you might have. Fresh veggies are great as well - additional garlic, leeks, and mushrooms will add awesome flavor. Add enough filtered water to cover the bones and veggies; bring to a boil. Once the water is boiling, add the vinegar, bay leafs, peppercorns and sesame oil. Turn down the heat to a simmer for at least 8 hours. The even MORE delicious alternative is to throw everything into a large crock pot and let it run for about 18 hours. Throughout the cooking process, skim off any foam and add water as needed. When the stock is finished simmering, allow it to cool before filtering through a fine mesh seive and bottle in mason jars. The stock will settle and the fat should rise to the top. You can pick off the fat and use it for cooking or toss it; scoop out the gelled stock and reheat to serve as soup. Put whatever you'll be consuming within 48 hours in the fridge; we suggest putting everything else in ice cube trays in the freezer while it's still slightly lukewarm before it's had a chance to separate. Once it's frozen, pop the cubes into a freezer bag which so you can defrost a single serving for just yourself or a larger serving when cooking for family or guests. The peppercorns keep the stock balanced and assist in helping the body to digest the broth. It provides a beautiful base for any other recipe you may be using it for; in order to use it to heal the gut and build blood, you need to get between 2-3 quarts a week into you. You can add the broth to any dish that you would normally add water to such as risotto, oatmeal, or quinoa. It adds a wonderful flavor and you'll be surprised how quickly you consume your 3 quarts. You can always add turmeric, salt, pepper, cumin, coriander, cinnamon, cilantro, cayenne, paprika, rosemary, garlic or whatever other flavors you're craving.